Single serving desserts in mugs are a favorite of mine because they're quick and easy, and the perfect way to satisfy a sweet tooth without completely overdoing it. This brownie takes about three minutes to make, including a minute in the microwave, but you would never know it from the rich, fudgy flavor. In a 12-ounce mug, whisk together oil, water, vanilla, and salt. Add cocoa powder, sugar, and flour, whisking until well combined between each addition. Microwave on high for 60-75 seconds (60 seconds will yield a gooey, molten bottom; 75 seconds will "bake" through). I like to microwave for 68 seconds to produce an almost fully baked, but still a little gooey brownie. 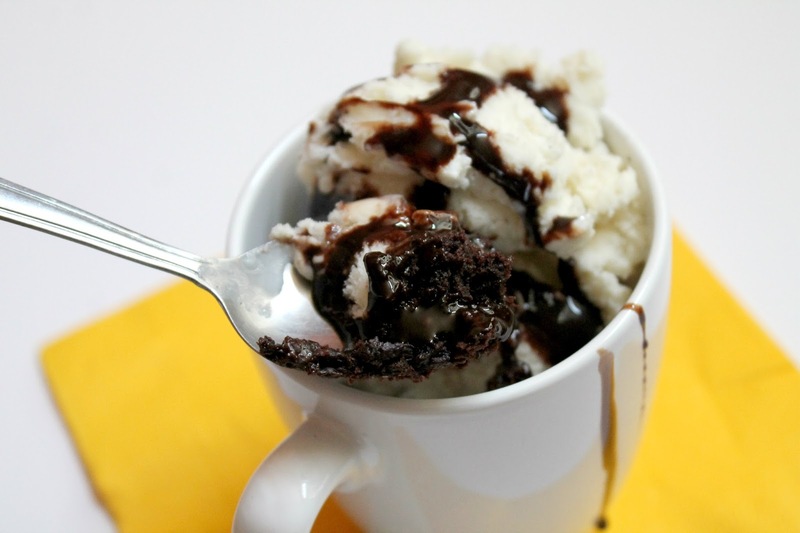 Top with a scoop of vanilla ice cream or frozen yogurt and chocolate syrup.